Lil' Bits "Always & Forever" continues where the FQB - Always & Forever Collection left off by containing many more elements, word art, etc. in order to enhance your creativity with this Collection. These digital elements are NOT included in the FQB "Always & Forever" Collection. 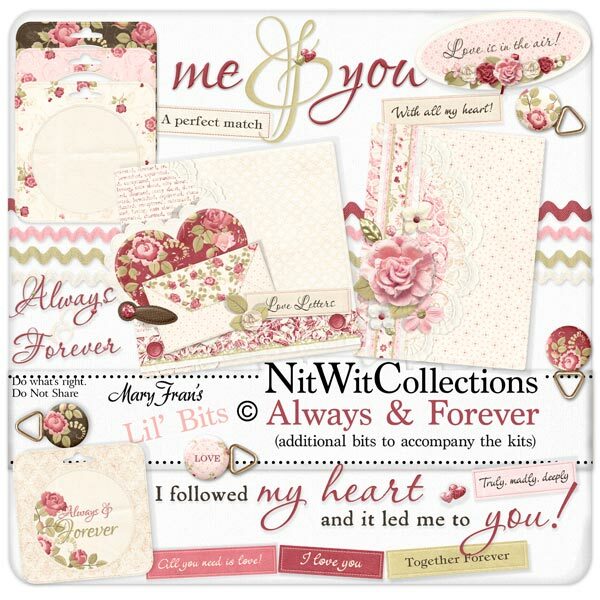 1 Topper - "Love Letters"
1 Wordart - "Love is in the air"
1 Wordart - "I followed my heart...."
1 Wordart - "Me & you"
1 Wordart - "Always & Forever"
6 Wordstrips with some sentiments we thought may work for you in case your get tongue tied!